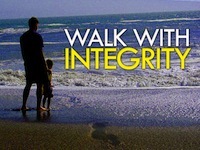 Nothing, absolutely nothing, is more important to your future than personal integrity. Webster defines it in one word: honesty! You can only hide your lack of it for so long. Eventually, like a faulty foundation in a storm, the cracks will widen, the roof will fall in, and everything you have worked for will be lost. ‘Getting away with it’ can be worse than getting caught, because it encourages you to believe that you can keep living at two levels. Listen: ‘Like a partridge that hatches eggs it did not lay, is a man who gains riches by unjust means…in the end he will prove to be a fool’ (Jeremiah 17:11). Do not think that you can do whatever you want in small things and be okay, as long as you have no major lapses. It is your first lie that makes you a liar, and whether you steal one dollar or one million, you are still a thief. Phillips Brooks says, ‘Character is made in the small moments of our lives.’ Integrity always puts character over personal gain, people over things, service over power, principle over convenience and the long view over the immediate.